ARLINGTON, Va. (May 17, 2007) -- Retired Air Force Col. Jim Russell visited the Air Force Memorial for the first time May 14, even though he has been in Washington, D.C., for about eight years now. He still works for the Air Force, some 36 years after he entered service in 1971, as a missile officer at Ellsworth Air Force Base, S.D. "I spent that part of the Vietnam era, 1971-1975, underground in South Dakota," he said. "We were part of the triad, the nuclear deterrent. My job as the deputy, and later as the commander, was to have command over 10 Minuteman II ICBMs, a secondary responsibility for another 10, and then the ability to interface with another 30. So between all of us on alert at any given time, we had responsibility for 50 ICBMs. We knew why we were there and what we'd be called upon to do if we had to do it." 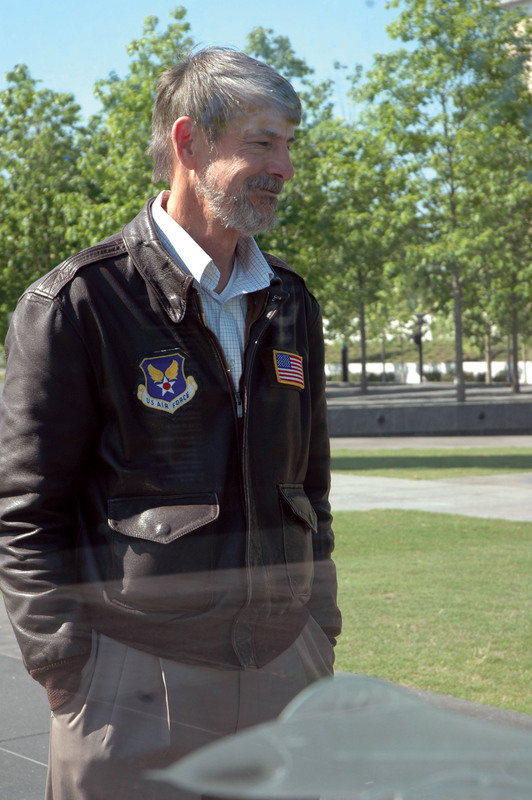 Retired Air Force Col. Jim Russell visited the Air Force Memorial for the first time May 14, even though he has been in Washington, D.C., for about eight years now. Russell served the Air Force for four years as a missile officer, then 26 years as a judge advocate. Today, Russell serves the Air Force as part of the Air Force Legal Operations Agency, a tenant unit at Bolling. The nuclear "triad" refers to the United States three levels of nuclear capability: intercontinental ballistic missiles, strategic bombers, such as the B-52 Stratofortress, and ballistic missile submarines. Today, Russell serves the Air Force as part of the Air Force Legal Operations Agency, a tenant unit at Bolling Air Force Base. His own father served as a pilot in the Army Air Corps during World War II. "He was a P-51 Mustang pilot, and was shot down shortly after D-day," Russell said. "He spent the rest of the (war) as a prisoner of war in Germany." Russell said his dad continued to serve until retirement in 1973, long after the Army Air Corps became the independent Air Force in 1947. His dad's service, he said, had some influence on his own decision to serve for so long. "All of us have a need to be part of something bigger than we are," he said. "And I had grown up in a military family, so it was kind of an easy thing to do." After just four years as a missile officer, the Air Force offered to send Russell to law school at the University of Houston, so he could come back to the service as a judge advocate. Russell served as a JAG for nearly 26 years, in places such as Moody Air Force Base, Ga.; the now shuttered High Wickham Air Station, England; U.S. Air Forces, U.S. Central Command at Shaw Air Force Base, S.C.; and a year deployment to Riyadh, Saudi Arabia, as the staff judge advocate for Joint Task Force-South West Asia. Russell said one of the reasons he stayed in the Air Force so long, and why he continues to serve at Bolling as a Department of Defense civilian, is the people in the Air Force. "The people, the jobs, it was the main reason I was happy to stay on and was glad I had the opportunity to continue to work," he said. "It's a job I understand, working with people I thoroughly enjoy, admire and respect. It's also a mission I believe in. So those things made it easy for me to continue to do that." Being in Washington, D.C., it is hard to miss the Air Force Memorial, and Russell said he has seen it from afar many times during travel between Bolling and the Pentagon. "I have seen it a lot," he said. "But this is the first time I have physically come up here and walked the grounds. Of course, you can see it from Bolling, and I come to the Pentagon a lot. It worked out today I was able to come here. It's a very impressive thing. And they've did a superb job of capturing the Air Force."